Nice to see you back so soon! This time we’ll be telling you everything we know about Solutions! And we know quite a lot, so buckle up, it’s going to be an interesting ride! 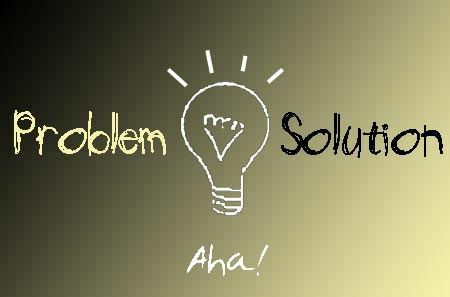 Don’t we just wish the solutions came from taking a bath and then shouting EUREKA!! Well, unfortunately, it’s not that easy. But who said, we can’t soak in the bath and come with the solutions to famine or wars? But if the bath is not helping in any way, it’s time for us to move forward to something more practical! Eh, off goes my bath sessions… Anyway, let’s ignore my blabbering and continue to what is important! Solutions do not grow on trees! We need to put work in analysing the problem that is in front of us and writing down anything that remotely looks like a solution! Wait, what? I want something like Problem … Aha! Solution! We thought so, but wait for some time, we might just give you that AHA! Remember our example from Problem? What’s That? We’ll be using it today too! But this time to show you how to write down your possible solutions! Now, let’s focus on one problem at a time! Let’s define the problem more in depth. Is it just general studying or is it studying for exams? or maybe students don’t have the good environment to study? We can come up with much more, but let’s settle for these for the time being! Let’s make our problem more personal and imagine John who is a university student and has a problem with the environment he’s studying in. His problem? He can’t concentrate on studying in any place, be it loud cafeteria or silent library. Did John’s problem ring a bell in any of you? Maybe you had or still have the similar problem? Now, let’s come up with a solution to help John study! If the bath is not your go to for solutions, you’ll have to do research. What is it that you’ll be researching? Your competitors, yes, you’ll be looking into what other solutions to John’s problem there is in the market, and maybe, this will help you come up with something innovative of yours! Find everything, write it down, and let’s move on to Step 2! It’s inevitable, but after research always come analysis! And let’s be honest, you found everything possible to help John with his problem of studying, so now you just need to pool everything together and give him your solution! And this time it’s going to help him. Step 3: AHA! Here’s my Solution! Did you get that AHA!? We sure hope you did, if not, just go back and look at everything you’ve gathered. Or reconsider the problem altogether. Maybe the solution out there is the best for now! But don’t give up hope, there are millions of problems out there that just wait for the solution! But if you still want to find a different solution, well, challenge yourself! And we’ll be here with you all the way! Think of it as a stepping stone to your future success!